MM 6.8-7.2mV Vital. Complex fine line micro-ground from a rectangular diamond billet. 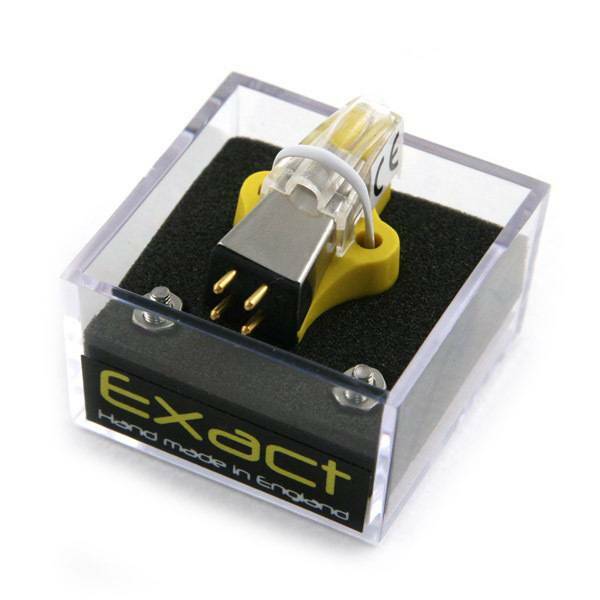 The EXACT shares the same body moulding as the rest of the Rega cartridge line. This is a one piece body and has no energy sapping joints between the stylus mounting and headshell contact face. The EXACT has a highly expensive non removable cantilever, fitted with a "Vital" diamond tip. The headshell face is machined perfectly flat to ensure maximum contact between the cartridge and headshell. Rega has designed and developed its own coil winding machine leading the way to new and innovative techniques in coil winding. Approximately one third less wire is used than in our other cartridges, making the EXACT even more efficient than the ELYS. 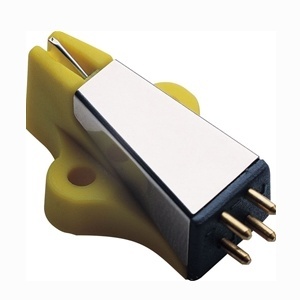 Rega entered the cartridge market in the early 80's and now has six moving-magnet designs. All cartridges are hand made by Rega utilizing custom coil winding techniques and ultra high precision molded bodies. The Rega cartridge is a one piece molding made of Pocan, a polymer with a hardness greater than industrial aluminum. Most cartridges loose high frequency energy by the movements generated in many joints created in conventional manufacturing. Most cartridges have five or six joints between the stylus mounting and the cartridge/headshell face. Rega cartridges have none! Most cartridges have to allow for large tolerances when manufacturing automatically with a reasonable gap of 0.7mm between the moving magnet and the pole pieces. 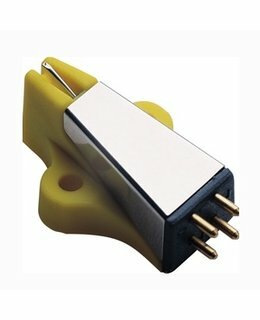 This gap on Rega cartridges is only 0.25mm, much lower than any moving magnet cartridge. The Exact shares the same body molding as the rest of the new Rega cartridge range. The body molding is a one-piece body and has no energy sapping joints between the stylus mounting and headshell contact face. The headshell face is machined perfectly flat to ensure maximum contact between the cartridge and headshell. Rega has designed and developed its own coil-winding machine allowing them to manufacture coils in a completely new and innovative way. This means approximately one third less wire is used than in Rega’s previous cartridges producing a more efficient and reduced mass cartridge. The Exact has a expensive non-removable cantilever, fitted with a “Vital” diamond tip. This tip fits into the record groove more precisely than the usual elliptical type, allowing more information to be gleaned from the records. Rega has not tried to create a false impression of product expense by using elaborate packaging. By using the simplest and inexpensive cartridge carton possible, yet still avoiding transit damage, Rega spends more on the cartridge itself - ensuring better value. Due to the design and extremely high tolerances of Rega cartridges, the assembly methods are more akin to watch making than to a mass production assembly line. Every cartridge is hand built. The highly skilled operatives use little more than tweezers and microscopes. Each cartridge is then adjusted and tested twice during a 24-hour period. Such methods are expensive and time consuming but Rega feels the result is worth it. We know you will too! "I was reminded of the Supex 900 sound of yore. This cartridge has a similar midrange sweetness, a rightness on vocals, saxophones ad strings, but at the same time it has a brighter, more forward balance, and a "modern" kind of snap and punch. The bass of the old Supex, and although it could create reasonable depth, the Exact is far from "laid back". But the Exact does have the ability to surprise you ccontinually with new detail from old records. Or perhaps it is wrong to say "new detail." Really what comes over is new life and pace. The Exact works wonders with pre-digital jazz, rock and R"n"B recordings." Stylus type: Vital. Complex fine line micro-ground from a rectangular diamond billet. Review door Roland Jansen, Geplaatst op 08-12-2014, 5 Ster(ren).